Northwestern Ontario has higher than average rates of cardiac disease. 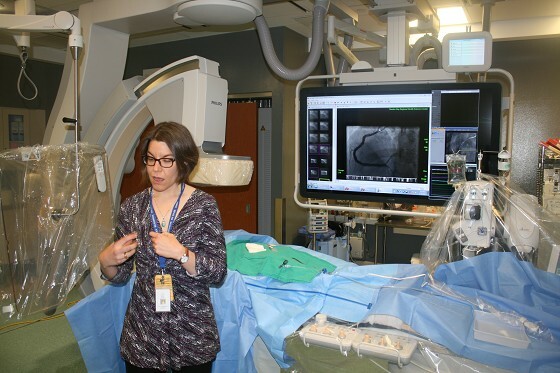 Now, those in need of treatment for complex heart disease, including heart attacks, have access to brand-new equipment in the cardiac catheterization labs at Thunder Bay Regional Health Sciences Centre (TBRHSC). The catheterization labs provide 24/7 services for emergent cardiac cases, as well as 80 hours of scheduled cases each week. Altogether in one year, interventional cardiologist provide 2,150 cardiac catheterizations, 710 percutaneous coronary interventions (angioplasty with a stent), and 210 pacemaker insertions. Each lab is equipped with a C-arm and imaging equipment to allow cardiologist to visualize the inside of arteries. In the original lab, the C-arm has been completely replaced, along with associated imaging equipment at a price of $1.4 million. The second, newer lab has also received necessary software upgrades to its existing equipment. Lawrence Dorey, age 51 who works for Health Canada had a heart incident 11 years ago where out playing in the backyard with his daughter.